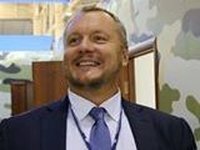 Ukrainian President Petro Poroshenko has signed an executive order on expatriation of Ukrainian parliamentarian Andriy Artemenko, who is charged with anti-state activities, lawmaker Oleh Liashko, leader of the parliamentary faction of the Ukrainian Radical Party, wrote on his Facebook page. "Today, Ukrainian president signed a decree to deprive People's Deputy of Ukraine Andriy Artemenko of Ukrainian citizenship on the grounds that he voluntarily acquired Canadian nationality in 2005. [...] This case, where a public official has been held accountable for violation of the Ukrainian Constitution, which permits holding only one - Ukrainian! - ID, is unique and first in the 26 years of Independence," he said. Liashko noted that therefore, he would request the Verkhovna Rada to consider early termination of Artemenko's status of a member of parliament. Liashko said that he has information that on Saturday morning Artemenko had flown to Vienna, Austria. Liahsko said he hopes that Artemenko would relinquish his Ukrainian passport on return. In February 2017, The New York Times reported that Artemenko had handed a detailed plan for peace in eastern Ukraine that he said he authored over to U.S. President Donald Trump's administration. The plan suggested holding a national referendum in Ukraine on 'leasing Crimea to Russia for a period of 50 to 100 years'. Ukrainian prosecutors are investigating a criminal case against Artemenko opened on suspicion of anti-national actions in collaboration with Russia. On February 20, Oleh Liashko's Radical Party decided to expel deputy Artemenko from its team. Artemenko is the initiator of the draft law on introducing amendments to the law on citizenship of Ukraine regarding dual citizenship. Prosecutor General of Ukraine Yuriy Lutsenko said that Artemenko had documented to the prosecutor's office that he has Canadian citizenship, in addition to Ukrainian citizenship: "He said at one of the interrogations that he was a Canadian citizen." Surprisingly, on the investigator's request to confirm this, he said: "Of course, the next time I'll bring the documents." At the same time, Lutsenko showed journalists a copy of the Canadian passport of the parliamentarian. On April 21, the Ukrainian Prosecutor General's Office requested Ukrainian Interior Minister Arsen Avakov to initiate the procedure of stripping Artemenko of Ukrainian citizenship with the State Migration Service of Ukraine.